All of the pieces featured in this post sold at my line launch back in May, but I thought I'd share pictures and a few details about each one to showcase the kind of designs I love to make. These are all one-of-a-kind pieces, but similar sister designs may make their way to my Etsy site in the future. Enjoy! This necklace features turquoise jasper coin beads, blue mosaic turquoise rondelles, a one-of-a-kind clay bead, African bone beads, gold-plated spacers, and a gold tone toggle clasp. The colors are a meeting of earth, land, and sea. I seriously love this necklace! I'm glad it has a beautiful friend to wear it! I intended these earrings to be limited edition, but supplier problems rendered them one-of-a-kind. These earrings feature purple acrylic beads with a contemporary (yet reminiscent of Moroccan) design. Antiqued copper floral beads and tiny purple seed beads complete the design. You may see a similar design soon, but these are the only ones for now! Named for the Italian city of Naples, this choker echoes the colors in Naples' flag. The necklace features oval red and green jasper beads that are a rich hunter greenish-black and steel gray with spots of green and red throughout. Each bead is different, making this necklace truly unique. 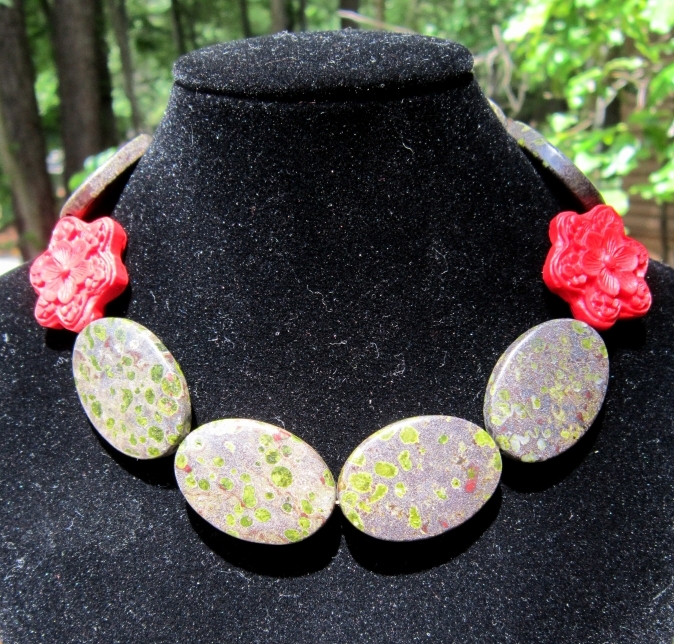 Carved red cinnabar flowers and a golden flower clasp complete this elegant design. This necklace has a matching bracelet that I will post for sale on Etsy soon! I take the time to name all of my pieces and choose names that reflect a piece's spirit. I named this bracelet featuring blue-green mosaic turquoise and an antiqued copper focal bead "Teagan" because of its flecks of rich teal. So, I hoped to capture the color I loved in this bracelet within its name. I may make copies of this bracelet, but because each hank differs in coloration, each bracelet will ultimately be one-of-a-kind. I love this bracelet! It gets its name from the antique curio shop in Cristina García's novel Monkey Hunting. This bracelet features a carved black lucky cinnabar fish of Asian design, frosted yellow fire agate rondelles (that change color in water), lava rounds, silver-plated spacers, and an awesome Tibetan silver lucky fish clasp. As with Teagan, I may make copies of this bracelet (because I seriously love it). But, as I said above, each hank of stone differs in coloration, so each bracelet will ultimately be one-of-a-kind. I love lapis lazuli and I love the dynamic energy of this bracelet. This bracelet features lapis lazuli stick beads of varying sizes accented with silver-plated spacers and completed by a Tibetan silver toggle clasp. As with Teagan and The Lucky Find, I may make other bracelets in this style, but, to risk sounding like a broken record, each hank of stone differs in shape and coloration, so each bracelet will ultimately be one-of-a-kind. Look for more lapis lazuli items on Etsy soon! Read the story behind the Blue Empress necklace here. Check out items for sale at my Etsy shop!